Finally, we are in Nassau. For the rest of the time we are in the Bahamas we have very short distances to travel as we island hop. Today, we left the anchorage at Chub Cay at 7:15 and arrived in Nassau at 12:55. It was a very smooth ride, although there were large swells. Daisy was thrilled to get here so she could walk off her ramp to the dock. 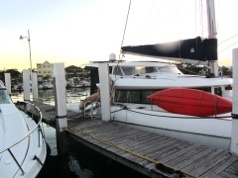 We are staying at Nassau Yacht Haven Marina, which is nice, but we had hoped to get a slip at Nassau Harbour Club. They had openings, but nothing for a wide catamaran. Next time we pass through we will try to make reservations in advance at the Harbour Club Marina. We have Internet at the marina which costs $10 for 24 hours. Without our wifi extender we can’t get their signal from the boat slip we are in, but we can get it on our iPad. We walked to a nearby strip mall with a Starbucks to use their wifi. Unlike Starbucks in the States where wifi is free, at the Nassau store we got one hour of free wifi with a drink. 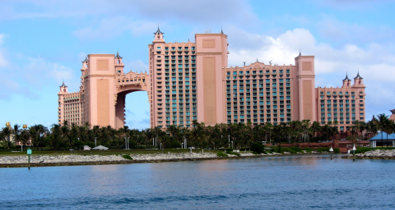 Above is a photo of the famous Atlantis Hotel and Marina we passed on our way to our marina. 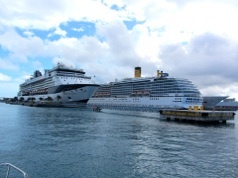 This is also a very popular stops for cruise ships and we passed several at their dock. Checkout time at Yacht Haven is noon, so we will head off to the stores in the nearby strip mall when they open at 9 am. I’m hoping to get new USB extension cords for our wifi extender. Hopefully that is all that is wrong with it. We pay $12 a day for unlimited water so we took advantage of it and washed all the salt off the boat. Most marinas in the Bahamas charge by the gallon for water. We did laundry too, which was only $2.00 a load, just like many marinas in the States. We are only staying here one night and then will head to Highbourne Cay or Normans Cay. We can easily get to them, even if we leave in the late morning. This might be the last blog entry for awhile until we can get wifi again.